Even the name has a certain mystique to it. Somewhat out of place in the sleepy state of Tamil Nadu but oddly right where it should be next to the old French colony of Pondicherry. I had little expectations upon arriving there. I had heard that it was created back in the 60’s by some crazy French woman and an Indian saint. I knew I was interested because they had reforested this huuuuuge area of essentially wasteland (well..as much as you can create a forest on semi-desert land in India). I knew that a lot of westerners lived there and many were engaged in what seemed like worthwhile projects, especially things like organic agriculture and agroforestry and education. My parents (who for those that don’t know me well are always a first reference point for me..I am ever astounded that they seem to know at least a little bit about absolutely everything. Which is awesome for me because it is like having a personalized Wikipedia), when I asked them had rolled their eyes a little and given me a kinda of half-assed answer which is generally indicative of something they initially think is a little silly but they don’t have enough dirt on to criticize or haven’t made their minds about up yet. So I went to Auroville with that basic impression only to be stupefied by what I saw there. Upon entering Auroville it is like entering any post-1960’s hippidom in India. All over India, with Anjuna Beach in Goa being perhaps the most famous, there are these enclaves of western tourists that come to India to find enlightenment through Yoga, spiritual teachings, drugs and most often a mixture out of the three.Originally, they were the tireless hippies who had made it as far as India in search of a sort of Hippy-Eden and for a while created one along the pristine shores of Goa (For a great Documentary, watch “Last Hippy standing”). What you end up finding now days is a group of perma-stoned-blissfully-ignorant-pseudo-enlightened beings who talk like they are Krishna personally and dress like my Dad’s first year anthropology students..the outfit of Arabic-pants, multiple overlaid hand-spun cotton or hemp shirts , some loose-hanging impractical bag,tons on bangely-clinking jewelry and a head-scarf. Oh and about a billion “Om” signs on any one or all pieces of clothing and jewelry and often tattooed on their body. Lets just call these people Waifs. Now in defense I must say that not everybody who wears Arabic trousers is a waif (Coincidentally I just bought two pairs of Arabic trousers, they are immensely comfortable and yes-they both have Om signs on them-not my choice but they were the only kind the store was selling). And not all waifs are bad people, they are just ignorant. It is one thing to know what you are buying and symbolizing by purchasing a commodity through the economic exchange system that has been socially marketed towards your preference and age group, and another to buy that product and not only ignore its tie to the economic world, but also imply that when you wear it, it somehow symbolizes the exact opposite and indicates that you are removed from worldly matters and focused on inner enlightenment. More than that it is the blatant exploitation of the Indian working force in most of these hippidoms, especially Anjuna beach, that has fostered my wariness and distrust towards all Waifs. There is just something disturbing about a bunch of white tourists that come to India preaching peace (“Shakti Shakti, man”) and end up riding around on scooters all day, polluting the environment, bringing crime and drug trade to the communities, exploiting the communities and leaving a horrible impression and a bunch of trash behind for the locals. To add to that I find them immensly boring and self absorbed. But, back to Auroville. I was already shuddering at the thought of what I might find behind the gates as we drove up.It looked like any other Indian hippy-town from the outside although it was definately french. It was clean (well, clean is also relative. Considering Chennai is pretty polluted, everything besides it seems clean), with a few cute patisserie shops and there was something….different, that I just couldn’t put my finger on . We made our way to the visitors centre a large sprawling complex with a few nice buildings and a food court of sorts. I go up to the room I think is the general information and suddenly I am seeing pictures of a bunch of Indians doing construction.Pretty pictures but still,there are more interesting things then half-naked Indians with bricks on their heads dangling from ropes. “Pretty exciting” I mutter sarcastically under my breath. That is until I walk around the full length of the room and see in the last picture what they constructed. I mean it is absolutely enormous, towering over the already huge Banyan tree that is supposed the be the geographical centre of Auroville. At this point all I know of Auroville is that they grow a lot of trees,practice organic agriculture, sell french pastels and construct giant golden globes. How.Friggen.Cool. Immediately sold on this concept I start my search for more information. As I finally find the actual information center the picture slowly unfolds. What they constructed is not, as the slightly peeved lady at the desk informs me, a giant golden globe it is a giant golden globe in the shape of an unopened lotus flower. Wooooah. And it is called the Matrimandir (It comes out like Maaaaahtrimandir, which at first I attributed to her Polish? accent until I realized that everyone pronounced it this way, the first syllable on a long exhale with eyes half closed and an air of exaltation and eternal peace). There are 8 “petals” surrounding this giant golden globe/unfolded lotus flower, each one is its own meditation hall and represents a trait of “the mother” (one hall is for beauty, one for youth and so on). 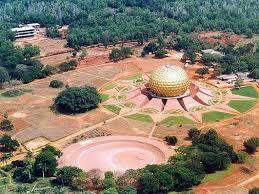 The giant golden lotus bulb is the main concentration hall where Aurovillians can come to meditate. And when I say huge I mean it is like 10 floors high. I swear. Google it. Apparently, it is constructed in such a way that mirrors on the top catch the sunlight and reflect it through a lone opening at the top of the giant golden dome to a lone crystal in the middle. There are these petals that spiral down so everyone sits on their own personal petal facing the crystal. My Malay-Indian friend who said she has been there once (it is not open to non-Aurovillians) swears it is actually quite a magical place. “A universal town where men and women of all countries are able to live in peace and progressive harmony above all creeds, all politics and all nationalities. 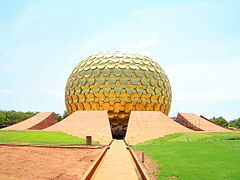 The purpose of Auroville is to realise human unity”. They have a charter, a special status in India and apparently something like 125 different nationalities living and working there. It still smells of a cult to me, everywhere there are these pictures of “the mother” (if it isn’t creepy enough that they call her “the mother” you should see a picture of her…). You can by books at the store and in Pondicherry they have a tomb for both of them which is strikingly similar to most of the temples I have visited (except that there are more white people, and it is cleaner, and there are no cows). But all my sceptisim aside I am genuinely curious. It seems that Auroville really has created something unique (asides from the giant golden globe…..) in that it has brought many people together to work on a single cause. It may just be another Indian Hippidom built on the backs of Indians, but it also may be a successful social experiment that could have much to teach about how to conciously live in a just and sustainable world. So, next weekend will find me seated in the giant global globe, listening to the madness around me in the one place in the world where it could possibly exist and still seem normal: India. just a quick reminder from your big sister that you LOVED Anjuna beach when we went there 🙂 love it, I laughed a lot – especially about the personalized Wikipedia. You should check out Sadhana forest right next to auroville. Amazing reforestation project and volunteer run camp. Their compost toilettes were my favorite. And “It is one thing to know what you are buying and symbolizing by purchasing a commodity through the economic exchange system that has been socially marketed towards your preference and age group, and another to buy that product and not only ignore its tie to the economic world, but also imply that when you wear it, it somehow symbolizes the exact opposite and indicates that you are removed from worldly matters and focused on inner enlightenment” –spot on. I love using this as a break from homework.